Celebrate 100 years with us Monday October 29th. The 7 hour birthday bash includes art talk with fictious installation Golf Courses in East Berlin Public Housing by artist Daniel Theiler; Made in Wicker Park panel discussion with former/current leaders of Wicker Park art institutions; food from 7 restaurants, sneak peek at upcoming photo album Around Chopin Theatre: A Century in Pictures & Stories; and dance party Environmental Encroachment 16 piece Orchestra, Rio Bamba Brazilian Band, Pianists W. Zuterek and S. Feher & DJ Jacques van der Line. "We are excited to celebrate 100 years of the Chopin Theatre in the neighborhood," said Zygmunt. "We believe in transformative abilities of art and how art influences the environment through civility and experiences. Chopin Theatre is a platform from which others can tell their stories and the Centennial celebration is a time to share the stories of Wicker Park's transformative years." "We are so proud of being a part of Wicker Park during such an important time in Chicago's history," said Lela. "This 100-year celebration shows the power one building can have in keeping a community feeling like a community. We want to make sure we have that space for people to come together and connect in a real way." 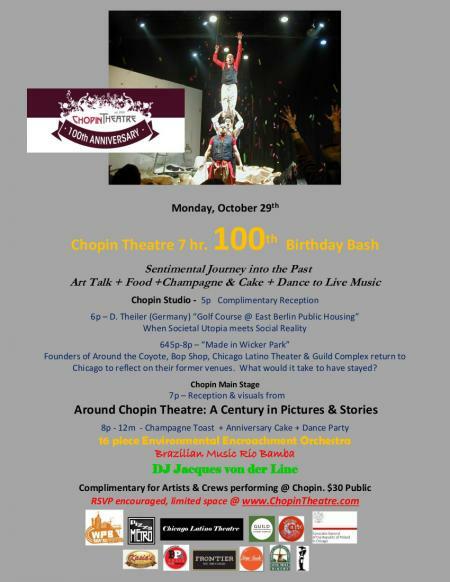 The centennial celebration fills the Chopin Theatre with activities from the downstairs Pregnant Buffalo Lounge and studio theater to the upstairs Main Stage. The event, described as an Art & Environment Get Together, includes, a panel discussion with leaders from former prominent Wicker Park arts organizations such as Michael Warr (Guild Complex), Kate Smith (Bop Shop), Edward Torres (Chicago Latino Theatre), Elizabeth Burke-Dain (Around the Coyote) and current owner of Chopin Theatre. Award-winning German artist and architect Daniel Theiler presents his recent work. There is also a complimentary reception, dinner and dance party. 6 p.m. - Daniel Theiler, award-winning German architect, will discuss his fictitious luxury golf club in the large socialist housing complex in East Berlin. 6:45-8p.m. - "Made in Wicker Park" - Leaders of Around the Coyote, Bop Shop, Chicago Latino Theater and Guild Complex come back to Chicago with reflections of their former venues in Wicker Park. What would it take for them to stay in Chicago. 7 p.m. - Reception for all the artists, technicians and supporters of Chopin Theatre with visuals from anniversary photo album,"Around Chopin Theatre: A Century in Pictures & Stories"
Celebration is free for past artists associated with Chopin Theatre. General admission, $30. A sneak peek of the book "Around Chopin Theatre: A Century in Pictures & Stories"
According to the Theater Historical Society of America, the theater opened March 11, 1918 and was designed by architects Worthmann & Steinbach. The nickelodeon originally had 546 seats and was operated by Victor Bardonski. In 1923 it was renamed the Harding and the seating capacity was expanded to 987. By 1931 it was called the Chopin again but underwent another name change to the Pix Theater. The building is located across the Polish Triangle in the area once known as Polish Downtown. In 1955 the building changed to Security Federal Savings & Loan which later moved across the street. When the Dyrkaczs purchased the building in 1990, it was vacant except for the small 200 sq. ft Eddie's Bistro. The Dyrkaczs have restored it to its present charm. Today, across three stages, Chopin Theatre presents over 500 events annually ranging from theater to jazz and classical music, literary events, films and social events. Since 1990, Chopin Theatre has presented over 120 of its own productions, mostly Eastern and Central European. It has hosted performers from each American state and from over 40 countries. It produced I-Fest, an international festival of solo performances which brought to 17 international artists from Austria, England, Finland, France, Germany, Lithuania, Poland, Russia, Slovenia, Switzerland and Ukraine to Chicago. It boasts of bringing over 1 million people to Chopin Theatre and Wicker Park. Famous Chopin Theatre alum include: Literature - Gwendolyn Brooks, Mircea Catarsecu, Jim Derogatis, Stuart Dybek, Michael Erik Dyson, Nikki Giovanni, Aleksandar Hemon, Malalai Joya, Yusef Komunyakaa, Greg Kot, Phillip Levine, Li-Young Lee, Haka Madhubuti, Luis Rodriguez, Sara Paretsky, Charles Simic, Zadie Smith, Studs Terkel, Michael Warr, Bronislaw Wildstein, Adam Zagajewski and Actors/Directors - Nathan Allen, David Cromer, John Cusack, Sean Graney, Sean Gunn, Witold Izdebski, Steve James, Krzystof Krauze, Mickle Maher, Anthony Moseley, Steve Pink, Jeremy Piven, Jan Peszek and Patsy Rodenburg; Musicians - Edward Auer, Peter Brotzman, Chuck D., Urszula Dudziak, Kurt Elling, Kahil El Zabar, Nils Frahm, Von Freeman, Fareed Haque, Adam Makowicz, Rob Mazurek, Dominic Miller, Third Coast Percussion, Ken Vandermark, and Paul Wertico; Visual Artists - Tony Fitzpatrick, Richard Horowitz, Tony Karman, Wesley Kimler, Aaron McGruder, Liviu Pasare, Ed Paschke, Art Shay, and Franciszek Starowieyski among many others. Approximately 2,000 events and thousands of artists and have graced the Chopin Theatre stage since 1990. For complete information visit the archives on www.ChopinTheatre.com. Burke-Dain is the co-founder of the Chicago arts event Around the Coyote. She has worked as a marketing and media profession with more than twenty years experience in transforming and elevating cultural brands such as the Poetry Foundation and Poetry magazine, Columbia College Chicago, and the Art Institute of Chicago. She is a specialist in institutional branding and creating dynamic visual identities. A proven track record of reinvigorating mission based organizations with innovative programming, media partnerships, social media campaigns and other content that speaks to and engages with new audiences. Dyrkacz came from Poland to the US in 1980 at the invitation of the U.S. Information Agency as an exchange student in Entomology/Biochemistry. After declaration of Martial Law in Poland he decided to stay in Chicago. In the 1990's he purchased five vacant buildings from demolition court including Chopin Theatre which he continues to work on restoring with his wife Lela. They have produced dozens of international and local shows. Smith opened The Bop Shop Cultural Arts and Entertainment Center at the border of the Ukrainian Village and Wicker Park in October 1989. The Bop Shop while noted for jazz, presented an eclectic offering from rockabilly, hip hop, jazz and swing to open mics and poetry slams. After the Bop Shop closed, Smith produced the documentary film "What it is to be a Woman in Jazz." She currently manages Kate Smith Promotions, continuing her work with emerging Jazz and Latin Jazz musicians. Torres co-founded Wicker Park's Chicago Latino Theatre in 1990 along with Henry Godinez. The theater later began Teatro Vista and Torres served as its Artistic Director until 2013. He is an accomplished actor and director whose recent credits include directing the World Premiere of "The Elaborate Entrance of Chad Deity" at Victory Gardens, which was named Best Play of 2009 by the Chicago Tribune, Chicago Sun-Times and Time Out Chicago; was a finalist for the Pulitzer Prize; and earned Joseph Jefferson Awards for Best Production and Best Director. He also directed subsequent productions at the Geffen Playhouse in Los Angeles and at Second Stage Theater in New York (Lortel Award for Outstanding Play and Obie Award for Best New American Play). Warr's books include Of Poetry and Protest: From Emmett Till to Trayvon Martin (W.W. Norton), and The Armageddon of Funk, We Are All The Black Boy, and Power Lines: A Decade of Poetry From Chicago's Guild Complex all from Tia Chucha Press. In 2017 he was named a San Francisco Library Laureate. Other poetry honors include a Creative Work Fund award for his multimedia project Tracing Poetic Memory in Bayview Hunters Point, PEN Oakland Josephine Miles Award for Excellence in Literature, Black Caucus of the American Library Association Award, Gwendolyn Brooks Significant Illinois Poets Award, and a National Endowment for the Arts Fellowship for Poetry. Warr is the former Deputy Director of the Museum of the African Diaspora in San Francisco and has extensive experience in community-based arts. He is a board member of the Friends of the San Francisco Public Library and Principal at WarrConsulting. In Chicago, he served as the founding Executive Director of the Guild Literary Complex from 1989-1999. Follow his life as an artist at armageddonoffunk.tumblr.com. Daniel Theiler, born 1981 in Bonn (Germany), is an architect and artist who lives and works in Berlin and Leipzig. He studied architecture at Berlin Technical University, The Swiss Federal Institute of Technology (ETH) in Zurich, and at the University of Strathclyde, Glasgow. He is currently enrolled in the international postgraduate Masters program "Public Art and New Artistic Strategies" at the Bauhaus University Weimar, during which he spends a semester at Chicago's SAIC. Daniel Theiler‘s works span installation, performance, video, and photography. They examine the gaps between social utopias and societal realities; they challenge conventions and question the usual in a cheerful and often humorous ways. His works have been exhibited at large German art festivals held by the State Theatres of Nuremberg and Weimar, by the Maxim Gorki Theatre Berlin, and at several biennial arts festivals in cities throughout Germany. Headd Dyrkacz went from public housing to the nice offices of Kraft Foods International using her MBA only to join the maintenance crew of Chopin Theatre under the direction of fearless leader and husband, Zygmunt. Her hobbies include translation for Zygmunt and being the Diplomat in Chief for Chopin Theatre.